It's taken me a few weeks to recover from the end of school semester frenzy of completing assessments, interviews, etc. I finished everything and now I'm super-happy that I have about 7 weeks left until I'm back at school again next year. One of the final assessments that I worked on was a supergraphic design. 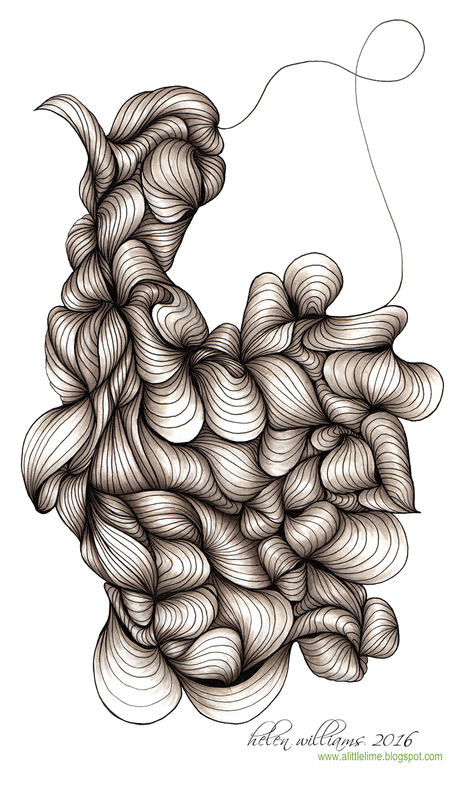 I really love Justine Ashbee's organic style and was very inspired by her work for the project. Since then I've found myself randomly doodling away in my journal in this style, it's very addictive with no formal beginning or end - the designs just evolve organically. "Block" style with some basic shading. Striping with a thread of red. Beautiful drawings, Helen. Your work always makes me smile. Fabulous artwork Helen. Love the digital graphic as well but your hand drawn items are much more interesting. You truly have a gift-a God whisper. 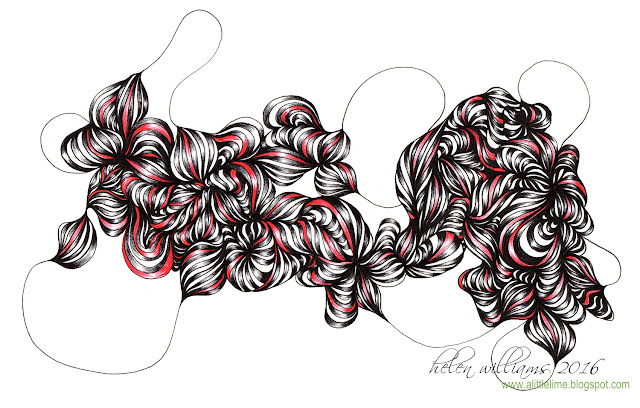 Helen, I love these organic doodles - I cannot seem to get my attempt to "flow" - would you consider a tutorial or short video on how to get started. I can imagine these would be incredibly calming and restful - but at the moment they are frustrating me! I find I need demonstrations (best) or clearly written instructions (not quite so good) to be able to find my inner freedom. I think the many decades of being told and believing I had no artistic ability has stunted my freedom to just jump in! I found a local artist who offered inexpensive group lessons. Once a week three of us meet and work. She has been very helpful for me in getting over those humps and stuck spots. We are all working on different projects and she helps to keep us all moving forward. I highly recommend it. Really nice work ! I love the one with the shading. I like doing organic stuff like that too, I do this when I'm bored. I named mine : "circonvolution" (brain convolution in English) because it reminds me the brain structure, don't ask me why ! Helen, enjoy your well deserved break from teaching. Coming from a teaching background I know how frenzied the last term can be. I am always amazed at your beautiful artworks. Hi Lianne. Thanks. This time I'm actually on the other side of the fence - I'm back at school as a student. Only another 6 months until I finish my the current qualification, then I have to decide whether I want to continue on to do more. I am so glad to see you doing this. I have tried it but am never sure where to start and where to go after a start. I wish you would continue and show us directions for this type of drawing. Love, love, love your work.